As a writer, when I watch a movie, I often try to discern the origin of the story. Unfortunately, this information is rarely, if ever, included in the extra features, so I'm often left to wonder. (By this point, I think we all know how they flip a car in a movie. So, I wish that they would focus less on that and actually interview the writer every now and then!) For most films, the story idea is quite obvious, as it's typically just a riff on an older idea. But, when you see something which truly has a spark of imagination, I want to get a sense of what inspired the writer. Or, in the case of The Age of Adaline, when we have a movie which plays like a very odd hybrid of genres, it would nice to know how such an odd combination came about. The Age of Adaline introduces us to Adaline Bowman (Blake Lively), and in the first few minutes, a montage which is accompanied by a voiceover, tells us her story. Adaline was born in 1908 and lead a very standard life in which she grew up, got married, had a child, and then lost her husband in a construction accident. While traveling one night, Adaline is involved in a car accident where she plunges into the water and is then struck by lightning. (This clearly wasn't her day.) This event causes a change in her body where she stops aging. Fearful that the FBI wants to capture and study her, Adaline spends her life on the run, constantly changing identities, but always staying in touch with her daughter. The bulk of the story finds her living in modern-day San Francisco under the name Jenny. She spends her time working in a library and planning her next identity change. At a New Year's Eve party, Adaline meets Ellis (Michael Huisman), a very forward man who insists on getting to know her. Adaline is very reluctant at first, as relationships only complicate her life, but she eventually begins to warm up to him, something which may jeopardize her secret. 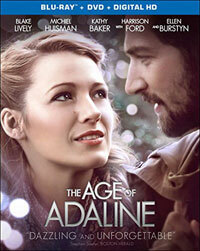 As I'd seen a trailer for The Age of Adaline, I'd assumed that it was based on a book. It just had that look of a sweeping epic which came from a novel. So, I was surprised to learn that the film comes form an original screenplay by J. Mills Goodloe and Salvador Paskowitz. But, not far into the first act, it hit me what this movie really was. It's the female, romantic drama version of 1986's Highlander. In that film, we meet Connor MacLeod, an immortal Scotsman who changes his identity every few years and then wills his fortune to his new self so that he can go on living the life to which he's become accustomed. Of course, in that movie, MacLeod was also on the lookout for other immortals, with which he had to battle every now and then. So, the two films certainly aren't identical, but I have no problem making the leap that Adaline is simply a female version of Connor MacLeod who is less prone to epic sword fights. I was also surprised to find the story engrossing. Adaline is a woman who, not unlike some screen vampires, feels that immortality is a curse. Instead of reveling in the fact that she is going to live forever, she lives in a world full of fear. First of all, as the feds attempted to abduct her on one occasion, she is afraid that it will happen again. Thus, she stays on the move. Because of this, she's also afraid of forming any strong bonds with others. Aside from her daughter, Adaline avoids other people when she can. (Although, she does have one friend who, for reasons that you'll have to learn, is unaware of Adaline's inability to age.) Thus, when Ellis comes along just when she plans to make another jump, it really complicates things for her. And that's just the first hour of the film. The second half contains a twist which I really should have seen coming, and then it explores more of Adaline's past. Which brings me to a point which I rarely, if ever, make -- this movie could have been longer. Not to stretch out the story by any means, but to give us more of an idea of what Adaline had been through in 107 years. Over the course of a nearly two-hour movie, we are treated to only a handful of flashbacks. Are they essential to the present-day story? In a way, they are. We needed to see more of what had happened to Adaline at various times in her life and how it made her the woman which we see today. This story could have easily been a TV series which would shown us more of Adaline in the past. As it stands, we look at this woman who is over a century old and wonder what things she has seen. That nitpicking aside, The Age of Adaline is a curious hybrid of a movie. This is essentially a romance, which just happens to have a science-fiction plot. Director Lee Toland Krieger has given the film a very nice look, and there are some notably good shots here. I actually watched some of Gossip Girl and I reviewed Green Lantern, so I must have seen it, so I'm familiar with Blake Lively's work. She does a very good job here in an understated performance. Adaline is a woman who is attractive, but does everything which she can to not draw attention to herself, and Lively handles this well. A nod should also be given to the costume design, as Adaline always dresses in a very classy way, but never like some who was alive when the Titanic sank. Every once in a while, Hollywood attempts to make one of these movies, which they refer to as "magic realism", and while The Age of Adaline is not without it's issues, it comes very close to succeeding in justifying this trend. The Age of Adaline doesn't help with stereotypes concerning women drivers on Blu-ray Disc courtesy of Lionsgate. The film has been letterboxed at 2.35:1 and the Disc contains an AVC 1080p HD transfer which runs at an average of 30 Mbps. The image is very sharp and clear, showing on overt grain and no defects from the source materials. Krieger has given the film a very muted color palette, so the occasional bursts of bright colors look very good. The image is never overly dark or bright. The level of detail is very good, as is the depth. The Disc carries a Dolby TrueHD 7.1 audio track which runs at a 48 kHz and an average of 5.5 Mbps. The track provides clear dialogue and sound effects. The car crash scene offers very detailed surround sound and stereo effects, some of which show individual sounds. These same moments deliver notable subwoofer effects as well. Throughout, we get stereo effects which show a nice range. The Age of Adaline Blu-ray Disc contains a selection of extra features. We begin with an AUDIO COMMENTARY from Director Lee Toland Krieger. "A Love Story for the Ages" (30 minutes) begins with an examination of the film's look, as Krieger discusses how he photographed the past and present in specific ways. From there, the locations, production design, and costumes are examined. This includes a ton of on-set footage, as well as a look at a visual guide which Krieger put together before the movie was made. "Style Throughout the Ages" (18 minutes) again focuses on the look of the film, examining costume, hair & makeup, production design, and cinematography, the piece shows us multiple time periods were tackled by the crew. There are many interviews included here, as well as concept art and behind-the-scenes footage. While this isn't a carbon copy of the previous featurette, it's still similar. "Discovering Young Harrison Ford: Anthony Ingruber, A Youtube Sensation" (8 minutes) shows how the actor was cast after his online videos were spotted by Krieger. We see some of these videos and hear Ingruber's story. The Disc contains two DELETED SCENES which run about 5 minutes.